Size: Specimens grow to around 30 mm carapace width and 20 mm carapace length. 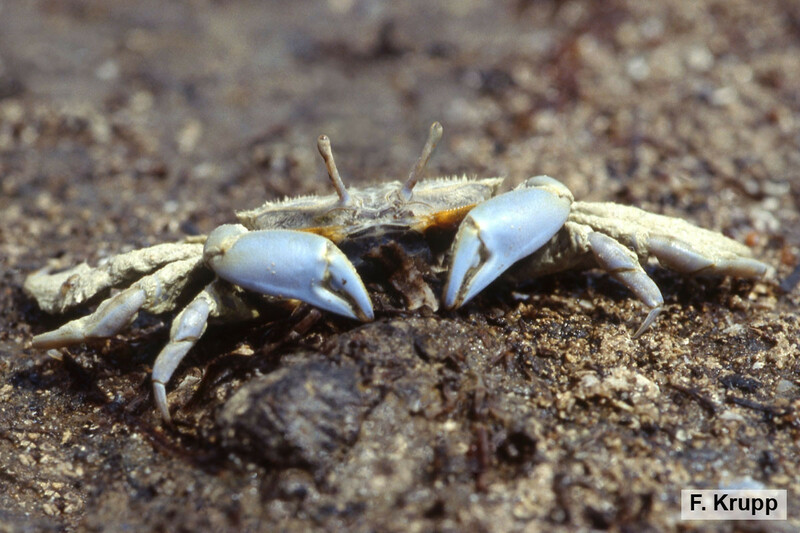 Mud Crabs inhabit the intertidal, the area between high and low tide marks, on sandy and especially muddy beaches and in mangrove areas. Throughout their range, they are common and even typical of the lower intertidal zone of mud shores. The crabs live in burrows and emerge at low tide to feed on small specks of organic matter that have drifted through the water and settled on the bottom (deposit feeders). The species is the most common of its family in mud-bottom environments in the Western Indian Ocean, with a wide distribution from southern and eastern Africa, the Gulf of Aden, through the Red Sea, southern Oman (Dhofar), the Gulf of Oman and the Arabian Gulf westwards to Pakistan and southern India. Macrophthalmus depressus has not yet been assessed for the IUCN Red List of Threatened Species. The squarish carapace is moderately wider than long, with a narrow front and deep furrows defining the gastric region, and studded with minute granules. Its lateral margin bears three distinct teeth, the first one at the anterolateral angle truncate and square-cut, the second one largest and the third one very faint and only indicated by some granules. The eyes are mounted on short, narrow eyestalks projecting sideways, but not beyond the anterolateral angle of the carapace. The first pair of legs bearing the chelae (chelipeds) are nearly equal. In males, the chelae have finely granulate margins and the inner surface of the palm and fingers is densely covered with thick bristles, while the outer surface is smooth. The stout and medium-sized walking legs are also covered with dense bristles, especially at their margins. Coloration of the carapace is bluish gray on the back, whereas the undersurface, especially around the mouth, is yellow with prominent red flashes.